SG-1 accompanies three scientists, Drs. Felger, Coombs, and Meyers, as they study ring technology on an apparently long-abandoned planet. When they receive an urgent message from the SGC, O'Neill orders Felger to return to Earth if trouble arises, and SG-1 leaves the scientists behind to investigate. However, Dr. Felger, who idolizes SG-1, disobeys orders and follows the team, only to witness their capture by enemy Jaffa. Certain that his heroes need his help, an enthusiastic Felger is determined to mount a rescue mission. Dragging a reluctant Coombs with him, Felger rings aboard the mothership and finds SG-1 in a holding cell. O'Neill is furious, and explains to the bewildered Felger that SG-1 had allowed themselves to be captured as part of a secret mission to make contact with Khonsu, a Tok'ra spy masquerading as a minor Goa'uld, who has vital information about Anubis. 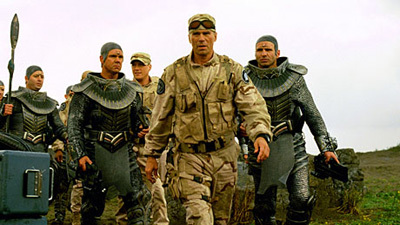 En route to Khonsu's planet, SG-1 is contacted by Khonsu's Jaffa, but as Felger and Coombs wait in hiding, they witness the murder of those Jaffa by forces loyal to Khonsu's First Prime, Herak. Realizing they are in danger of discovery, the scientists disguise themselves as Jaffa and ring down to the pyramid on the planet to warn SG-1. Herak reveals Khonsu's treachery as a spy, and kills him before taking command of his forces and imprisoning SG-1 once again. However, Felger and Coombs make their way to the control room of the pyramid and disable the force field that is holding SG-1. Together they must fight their way through waiting Jaffa, and rescue a terrified Coombs who has become trapped within the pyramid, before finally making their way back to the stargate. Once safely back on Earth, Felger and Coombs are awarded the Air Force Civilian Award for Valor for their bravery in rescuing SG-1… as Felger is roused from his daydream. Jay Felger is a lecturer in residence at MIT with four post-graduate degrees. He idolizes SG-1. Simon Coombs is a professor of applied math at Yale. He has a Vespa and two cats, and is a huge fan of Star Trek. Khonsu had collected vital information on how and where Anubis is getting his new technology. Her’ak, First Prime of Lord Khonsu of Amon Shek, revealed Khonsu’s true identity as a Tok’ra operative and killed him, taking command in the name of the one true god, Anubis. The award ceremony was to present the Air Force Civilian Award for Valor, for bravery in the face of grave danger. If this was a Trek convention, you’d be all dressed up like a Klingon. Vulcan! And I don’t know how you can call youself a scientist and not worship at the altar of Roddenberry! Something to do with a tachyon emitter? We might as well be wearing red shirts! So, when are we going to meet this old “Ginsu” guy?